At least a dozen ice cream parlours, car accessory shops, hardware, electrical shops, stationary and a bustling Brahmin Tiffin Bar, a Public Sector Bank, a huge shopping centre and a former chief minister’s residence lie in the very busy 80 feet road in Sanjay Nagar, RMV 2nd stage, falling under Ward 18 in in Bengaluru. The 80 feet road starts from Sanjay Nagar and ends at MS Ramaiah Hospital Signal. It connects Sanjay Nagar Main Road to New BEL Road. The road is a vital link to office goers, school children, patients visiting MS Ramaiah Hospital etc. Sadly, the 1.5 kms footpath stretch on both sides has been encroached by commercial establishments like car accessory shops, electrical, hardware, eateries and other shops, putting the pedestrians at huge risk. 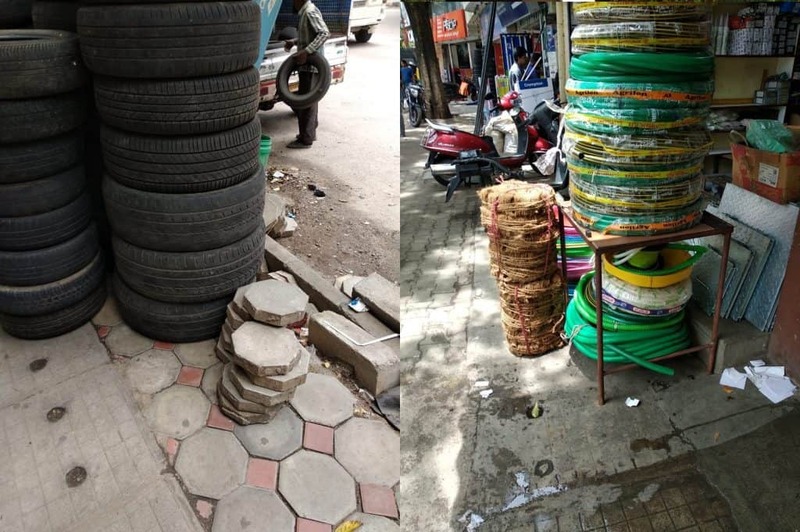 The bus stop at Ashwath Nagar (near Pit Stop) is completely encroached with tyres, while a garage conducts car servicing on the footpath. Many children, officer goers, patients and senior citizens are forced to use the road to walk, risking their lives. The lack of free movement on the footpaths has resulted in many falls, resulting in bruises and minor injuries. The encroachment and haphazard parking affects the maneuvering of BMTC buses, often resulting in traffic jams. BBMP unhelpful, traffic cops clueless! The traffic police are oblivious of the state of affairs. Despite a clear ruling by the High Court of Karnataka to clear footpath encroachments, the BBMP is not acting tough on the encroachers. The traffic police have expressed their helplessness as it is the BBMP’s responsibility to clear the encroachment and not that of the police. The section 288 and 288C of the KMC Act clearly allow the removal of encroachments, either temporary or permanent, on the existing footpaths falling within BBMP’s jurisdictional limits. However, several complaints to jurisdictional Assistant Executive Engineers by citizens have not yielded any results. They pass the buck at each other dodging responsibility. The Corporators of Ward 18 (Radhakrishna Temple) and Ward 35 (Aramane Nagar) and the AEEs of the wards in a joint exercise need to remove the encroachments which are in gross violation of HC order and KMC Act. The road is a border between two wards, also belonging to two assembly constituencies, thus the responsibility lies on both wards and both assemblies. There are chances of a serious accident if the issue is not fixed on this road’s footpaths. 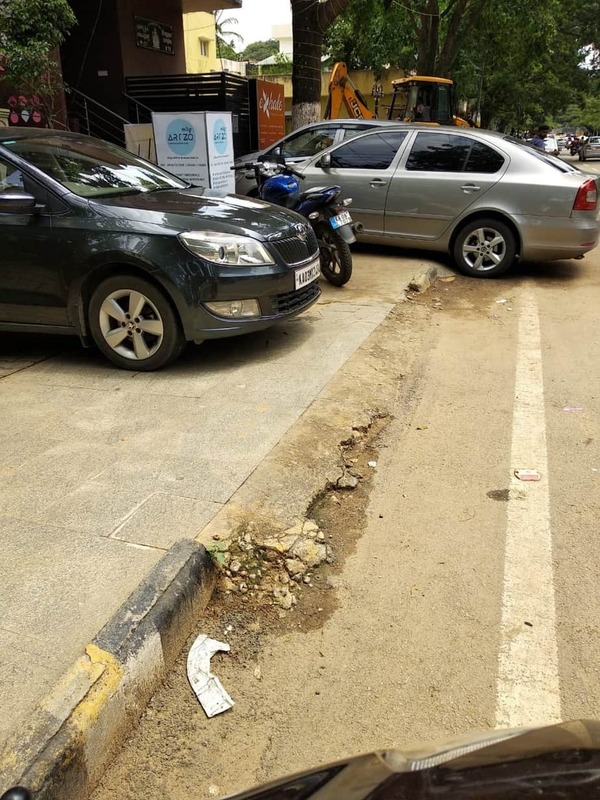 The BBMP officials and people’s representatives including the Mayor should inspect the road and the footpath and implement a ‘zero tolerance’ on footpath encroachment in the 80 feet road in Sanjay Nagar.